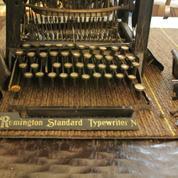 The images above are a what is left of a rare Remington No. 7 from the early 1900s that was damaged in shipping. This is what could happen to your typewriter if you don't pack it for shipping the correct way, or what happens if you receive a typewriter that was packed the wrong way. 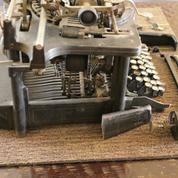 Many typewriters are lost daily due to careless packing. In fact, typewriter shipping is one of the biggest problems that typewriters have in terms of surviving in the modern world. You must expect your typewriter to be thrown around, to be dropped from waist level about 15 times, for heavy objects to be piled on top of it, and for it to be laid down on every side of the box. If you prepare the correct way for all these traumatic things your typewriter will be going through in its shipment journey, then it should survive, that is, in one piece. If you buy a typewriter off the internet and you suspect that they don't know how to pack it properly, give them the link to this page! 1. If possible, it's best to have the carriage release engaged in order to protect the escapement mechanism. With that released, the carriage will be free to slide around, so make sure you have a way to secure the carriage. Foam is especially useful for this, but other materials can also be handy. If the carriage has a carriage lock, be sure to make use of that feature. 2. Put a piece or two of rolled up newspaper inside the typebar mechanism, so that the typebars do not hit the platen during shipping. Although this may not be life or death for your machine, it helps keep the typebars from possibly impacting the ribbon and platen and messing things up. 3. Wrap the machine in bubble wrap (medium sized) so that the whole machine is covered with it, and so that if the typewriter somehow gets loose inside its case, it won't be moving and bouncing around. Balled up newspaper/packing paper can also be used in addition for padding. A good rule of thumb for judging- if there is a little resistance when you try closing and latching the case, that's probably enough to keep it from going anywhere. Obviously, don't over-stress the latch/case, and make sure the case fully closes and latches before moving on to the next step. 4.. Wrap the case in bubble wrap (large sized) so that the whole case is covered (if it has one) If it is a desktop model, make sure to wrap the machine with several layers of large bubble wrap to make up for the protection that the case would have provided. 5. Get a box, preferably new, however you can recycle boxes if they are in good enough shape and are sturdy/large enough. Make sure the box allows about 2-4 inches of room between the edge of the typewriter, and the inside of the box. You will put packing peanuts and/or balled-up newspaper/packing paper in that space. 6. Put packing peanuts about 2-5 inches deep inside the box, then cover the peanuts on the bottom of the box with paper so the typewriter doesn't sink into the peanuts and end up on the bottom of the box. 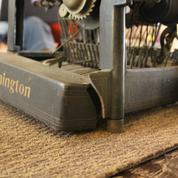 With the typewriter now sitting on the cushion of peanuts, you can insert packing pillows, newspapers, or packing peanuts to fill the spare 2-4 inches along the sites. When using newspaper/packing paper, I find it helpful to place the crumpled pieces in the four corners first, and then go from there. 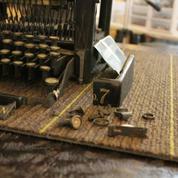 ​After that is done, cover the whole typewriter with packing peanuts until it fills the box. Tape up the top of the box. After you do that, your are finished with packing. 8. You are ready to safely ship your typewriter. I personally use and recommend UPS, however USPS and FedEx are alright too. 9. Make sure to insure your typewriter for what it's worth. Never be overconfident that your typewriter will be okay in shipping. For UPS insurance, it's only $2 extra to get $200 worth of insurance, which is worth it. Especially if your typewriter gets damaged.